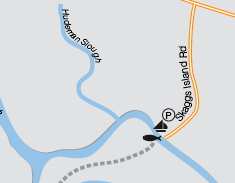 Earlier today I accidentally walked south of the bridge, onto Skaggs Island itself (area with dotted line). This evening I returned to walk the "bottom half" of Skaggs Island Road (double yellow line on Bay Trail map segment shown at right). I would have kept going toward Ramal Rd., but the sun set, and there were no street lights in this area. After walking earlier this afternoon when it was quite hot, it felt wonderful to return later in the evening, when it was cooler and there was a slight breeze. The sun was setting and the light was rosy and golden. It was quiet, except for bug and bird noises. Beautiful. 1 ball; 15 little brown jobs (LBJs); 2 ladybugs; 2 killdeer; 10 swallows; 1 dragonfly; and 1 hawk.